AMSOIL Synthetic Vehicular Natural Gas Engine Oil is recommended in mobile applications fueled by compressed natural gas (CNG), liquefied natural gas (LNG) or liquefied petroleum gas (LPG); including transit buses, medium/heavy duty trucks, refuse haulers, school buses and delivery trucks. It is formulated for applications requiring Cummins CES 20074. AMSOIL Synthetic Vehicular Natural Gas Engine Oil (ANGV) delivers superior protection and performance in natural gas engines calling for an API CF 15W-40 low-ash lubricant. It is formulated specifically to meet the special requirements of natural gas fueled engines used in vehicles and mobile equipment. The synthetic base oil and advanced anti-wear additive system of Synthetic Vehicular Natural Gas Engine Oil provide enhanced valve train protection, whether roller or slider followers are used. It is formulated with high levels of zinc and phosphorus to provide outstanding wear protection in mobile engines requiring Cummins CES 20074. 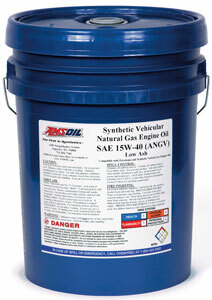 Synthetic Vehicular Natural Gas Engine Oil’s low-ash formulation deposit formation. It is designed to reduce valve minimizes valve stem and combustion chamber recession, a common problem with low-ash oils, while its thermal stability allows it to effectively combat oxidation and oil degradation. Its balanced formula allows for a high total base number (TBN) to neutralize acids and protect against corrosion while meeting low ash requirements. The shear stable formula of Synthetic Vehicular Natural Gas Engine Oil offers maximum protection against viscosity loss while providing optimal service over a broad temperature range. It has inherently low volatility to reduce oil consumption and emissions, helping maintain serviceability of emissions equipment. AMSOIL Synthetic Vehicular Natural Gas Engine Oil may be used for extended drain intervals when monitored by an oil analysis program. When extending oil drain intervals, change the oil filter at the OEM-recommended interval.